I’m Isabelle, mum to two extraordinary young people. One of them, Matthew, is autistic and has learning disabilities and a whole host of other differences including ADHD, Acute Generalised Anxiety and OCD. 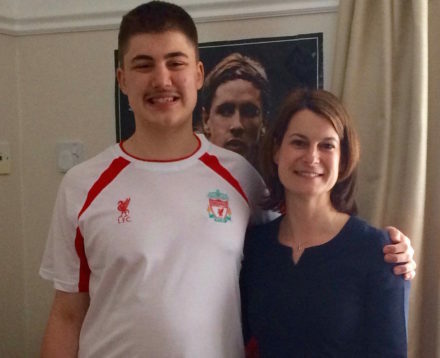 He has always faced a significant number of challenges, but when Matthew was 15, he really started struggling and his behaviour became extremely challenging to other people at his residential special school, to his family and to himself. To cut a very long story short, we asked for help but precious little was forthcoming. The mental health professionals advised us: “if things get too bad, call 999”. The months ticked by, and Matthew’s behaviour became increasingly unpredictable and violent. Finally, he reached crisis point and was sectioned. The child psychiatrist referred Matthew to an independent mental health hospital. He assured us that this was the best place for Matthew to be assessed and receive appropriate care and treatment. We were told that Matthew would be away from home for up to 12 weeks. But Matthew did not receive appropriate assessment, treatment or care. And he didn’t come home for almost two years. Matthew didn’t understand why he was in hospital. He thought he was in prison. But he was guilty of no crime – only autism. Matthew was locked in a complex mental health system that made no reasonable adjustments for his needs. The doctors said Matthew needed to take anti-psychotic medication, a medicine that is formulated for people with psychosis, a serious mental health illness. Autism isn’t a mental illness and Matthew was not mentally ill. He didn’t want the medication; he didn’t like the way it made him feel. Yet Matthew was prone restrained, face-down, by up to six adults and forcibly injected with a high dose of anti-psychotics at least every two weeks. Matthew deteriorated catastrophically and we began to fear for his life, but the doctors said he had to stay. We had to do all we could to get Matthew out of hospital. We asked our Labour MP Helen Hayes for help and she visited Matthew and attended a hospital meeting with us. She was very concerned. Having used every ‘normal channel’, we had no option but to start a media campaign. Eventually, the Care Minister found out about Matthew’s case and set up a review. It found that “a crisis could have been predicted and potentially prevented” and “social care, education and health… lost sight of [Matthew]”. Significantly, the report acknowledged Matthew’s was not an isolated case. Behaviour can communicate unmet need, not mental health illness. Matthew’s behaviour had deteriorated because he didn’t have enough support. Crisis could have been prevented if he had that help. Being in hospital didn’t help Matthew. It wasn’t appropriate. It made him more vulnerable. National guidance says it “very rarely” will be helpful, yet our health and care system still relies on it heavily. Especially for an autistic person, being kept in a hospital, unable to go outside, unable to see family and friends, unable to do the things that make them happy, can only increase this anxiety. Tragically, it wasn’t just being in a hospital environment that damaged Matthew. The care and treatment that he got in hospital was very wrong. The doctors making decisions about Matthew had no training in autism, learning disabilities or both. This lack of understanding resulted in mis-diagnosis and inappropriate care. The good news is that, at last, we managed to get a second opinion from a psychiatrist with the right expertise. They visited Matthew in hospital and assessed him. At last Matthew’s strengths and difficulties were understood and a way forward found, with Matthew moving out of the hospital into the community. He hasn’t looked back since. Now his needs are understood, he is no longer contained, restrained, secluded or over-medicated. If fact, he is no longer prescribed any anti-psychotic medication at all. But this felt ‘lucky’ when it should be normal. Matthew’s story shows that autistic people or people with a learning disability shouldn’t be in hospitals. This is possible with the ‘right support’, but as the NHS hits its 70th birthday we need to be clear about what our ambition is. We need to move beyond health being about hospitals. It’s not rocket science, it just needs up-front community funding and a government to lead the way. And it is significantly cheaper than the wrong support. Matthew is living proof that people on the autism spectrum, with learning disabilities or both, need homes not hospitals. Matthew still faces significant challenges but because his needs are now met, his behaviour and quality of life has improved. At long last, he is safe, happy and learning, but had it not been for our MP and finally finding those experts, it would be very different. Isabelle Garnett is a Labour member.